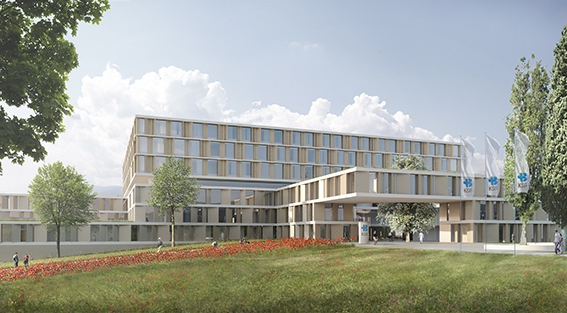 Baden Canton Hospital (Kantonspital Baden KSB) is the primary hospital in the eastern part of Aargau Canton. It began operations in 1978 following a six-year construction period. After 35 years of intensive operation, comprehensive renewal measures became necessary due to operational, physical and technical deficiencies. A new building where all important functions and tasks will be bundled more efficiently than before forms the core of the design concept. It is situated in the immediate vicinity of the existing building. To accomplish this, the owner implemented a study contract for a general planning team in a selective procedure, which was won by Nickl & Partner Architekten Schweiz AG in early 2016.